This season seems to be passing me by in a blur of school work, work work, cleaning out my mom's house, and trying my best at interviewing--all interspersed with blurry evenings with friends. But I've claimed my Sundays as a day to (slightly) relax and treat myself with some roast chicken. A few weeks ago, the chill in the air and some potatoes in my fridge inspired a roast chicken dinner. But it didn't come out exactly the way I wanted and all week I kept thinking of experimenting with different marinades, so the following Sunday, I stopped by The Meat Hook for another half a chicken. Now, for the third week in a row, I walked on down to my favorite butcher, picked up my chicken, said hello to friends, and continued my latest Sunday tradition. This week I chose to make a marinade of brown sugar and maple syrup with a touch of ginger, and sides of roast potatoes, green beans and beets. 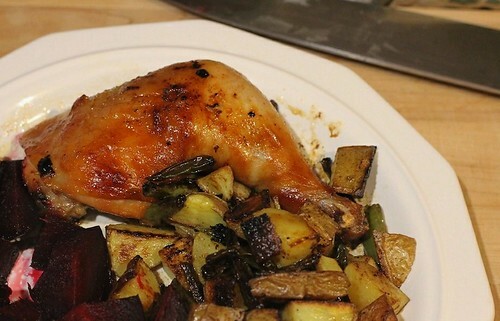 (If you need help on the beet roasting, follow our friend Cathy's recipe.) An hour in a 425℉ oven-- first 30 minutes tented with foil, last 30 not; basting a few times; and boom. The potatoes and beans go in for the second half hour to get nice and crispy. I still want to get a beautiful crispy skin, so expect more updates on my roast chicken adventures.